Summer 2016 saw the launch of Open Treasure, a new world-class exhibition route which has transformed the experience of those visiting Durham Cathedral. This spectacular new visitor attraction reveals the remarkable story of Durham Cathedral and its incredible collections, with interactive exhibits and activities for visitors of all ages. 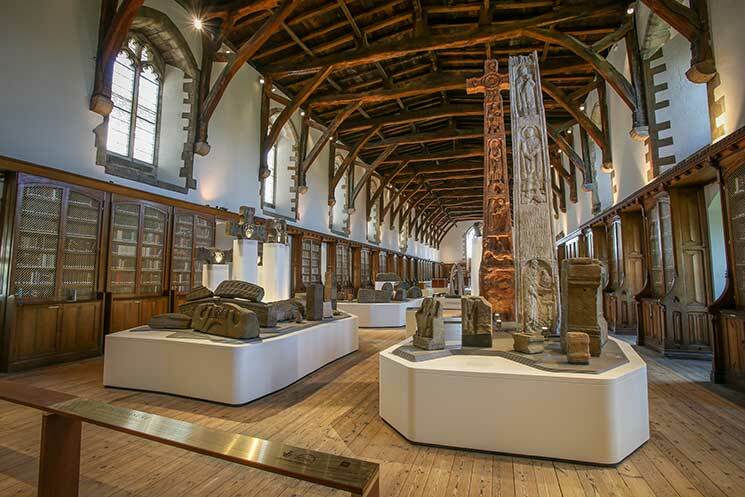 1 Open Treasure is located at the heart of Durham Cathedral’s claustral buildings, which together represent the most intact surviving set of medieval monastic buildings in the UK. 2 The journey begins in the magnificent 14th-century Monks’ Dormitory, the only intact monastic dormitory in the UK with an original oak-beamed ceiling rivalled only by Westminster Hall in London. 3 Over the last 700 years, the Monks’ Dormitory has been a dormitory, a library and was even converted into a two-storey house! 4 The Monks’ Dormitory includes a timeline exploring the history of Durham Cathedral. Interactive exhibits and activities evoke the atmosphere of life in the medieval monastery with sights, sounds and smells. 5 The new state-of-the-art Collections Gallery includes specially designed cases created by two prestigious case manufacturing firms, Goppion and Bruns, who have also designed cases for The Louvre and The Rijksmuseum among others. 6 The first exhibition in the Collections Gallery is ‘The Making of Open Treasure’, a testament to the unsung heroes of the project including the Cathedral’s own stonemasons and joiners who were integral to the creation of Open Treasure. 7 The Cathedral’s collections include over 75,000 items, including 30,000 early printed books and manuscripts, some of which will be displayed as part of a rolling programme of exhibitions in the Collections Gallery. Annual passes are available to enable visitors to make the most of the rolling exhibition programme. 8 The visitor experience continues in the Great Kitchen, a stunning space which is one of only two surviving monastic kitchens in the UK. 9 The Great Kitchen once catered for the monks of Durham Cathedral’s monastery and was used as a kitchen until the 1940s. You can still see evidence of the fireplaces, a bread oven and even a spit! 10 The Great Kitchen will eventually house the Treasures of St Cuthbert, following a period of environmental monitoring. These extraordinary artefacts represent some of the most precious surviving examples of Anglo-Saxon and medieval metalwork, textiles and woodwork, and will go on display in late 2017. In the meantime, visitors can enjoy an awe-inspiring exhibition of church plate and metalwork.